I'm shooting for Barrow, AK next year. Coach class of course. Anyone want to join me? You were not the subject of my finger wagging. Alaska is on my list. I want to surprise my wife by taking her to a Packers game for our first wedding anniversary. We live in NJ and she's a huge fan, but she's allergic to spending money on things like this. I have the flights covered with MR to BA but can't decide which way to go on the hotel. I can get 2 nights at a Hampton Inn for 60K HH points (room cost approx $1600(2.7 cents/pt)-they sure do get greedy on game weekends) or 2 nights at an Aloft for 14K Starpoints ($800 approx(5.7 cents/pt)). The better point/$ redemption is Starwood by far but I have a hard time letting go of them due to the 25% air mile transfer bonus. Am I being silly by wanting to to hold the Starpoints for something better in the future? I was planning on saving the HH points for a trip next year but I'm not very attached to them since they are relatively easy to acquire. Don't get caught up on this cents/pt redemption. Do what works best for you not what works best for others. I want to take a fishing trip to Pelican, Alaska one of these years. King Salmon, Halibut, Ling Cod, Yellow Eye Rockfish. I don't even like fishing, but the idea of a couple hundred pounds of pristine, wild-caught seafood just sounds appealing. Make sure to check out the BOA AS card. BOA likes to approve more than one at a time. I mentioned in my original post that my first few choices for Hilton properties in Chicago this weekend were unavailable, so I ended up using the weekend night certificates from 2014 spending on the Citi Hilton HHonors Reserve card at the Hilton Suites/Magnificent Mile. 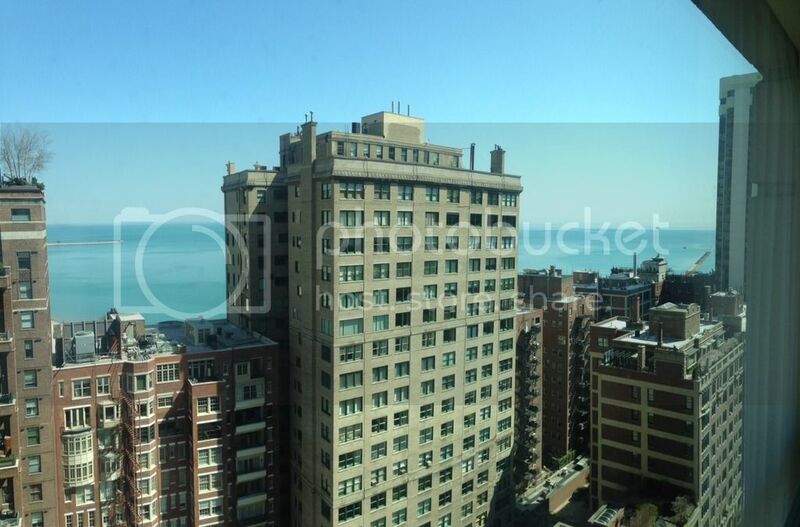 The room itself is Airport-Hilton grade, but the location is great... right next to Michigan Avenue and adjacent to the Hancock Building. I have an East-facing corner suite on the 20th floor. I would have preferred a skyline view, but this will work. I'm not in the room much. I still have Hilton Gold status from either the Reserve or the Hilton Amex, both of which have been closed for several months. This may have gotten me a better room with a semblance of a view. I wouldn't call this redemption aspirational, but the impending expiration of the certificates got me off my flowers and to Chicago, so I have exactly zero complaints. It's been a fun weekend with old friends. Yesterday we toured Pullman, went on a helicopter tour and had dinner at The Rosebud. Tonight is Book of Mormon (third time ) and dinner at Paris Club. Awesome cv. I stayed at The Tremont just nearby last spring but I would say that hotel is way past its prime. Still a decent location though. I recommend grabbing a drink at the top of the Hancock building at night if you have never done so. Forgot about that Last time I was at the top of the Hancock building I had a fake ID. Having a drink, and a cloud comes by an envelops the windows, and then a couple minutes later you can see again. I lived here for five years, so I've had the opportunity to do that a few times. The helicopter tour yesterday is the best way I've found to see the city (and Indiana, and Michigan and Wisconsin) from above. I agree. I think people worry too much about cents/pt redemption. I have learned what matters to me is focusing on what will make the best vacation as far as location and ease of access to what I plan to do. That is why cash back is king. No matter where you go you can use it, no restrictions. This is where I enjoy the wannabe miles cards. I can book on travel site for cheap and redeem "miles" for statement credit. I didn't realize you were here this weekend. Damn. Well I guess I would recommend the water taxi. I usually take it all the way to Chinatown. If you are on N Michigan you can catch it right by the Trump building. DO NOT just walk over there thinking you'll find it. Look it up on GMaps first. I get that-just wanted to see what opinions were out there on the matter. I agree. The Aloft looks like a nicer property and has a bar-the Hampton doesn't. Unfortunately when I went to reserve the room this morning, they were fully booked. I may choose another game to go to with better room availability and better game ticket prices. I booked RT business class (lay flat) from San Francisco to Athens on BA using 180k avios and a companion pass. The miles were accumulated by 1 100k mile signup bonus and another 75k mile signup bonus. The companion pass was from spending $30k on the card in CY2013. I also booked economy flights between Athens-Istanbul-Florence for another 60k avios all in for both of us. Oh, there was like $1500 in taxes and surcharges IIRC. Forgot that. That is definitely the downside of flying BA. If you're booking solely with miles United is a better deal. For this trip, though, with a companion pass BA was the best deal. MSRP on each seat is about $10k so it was certainly a good deal. Getting the largest value for your rewards should be everyone's focus. The key is to earn rewards that you know you can make use of, and then maximizing that value. Having rewards points that you can't make use of gives you a value of $0.00 per point. It may be the king of convenience, but that is all. If you have the ability to earn and use airline miles, especially for international biz/first class tix, you will come out far ahead in redemption value. That being said, not everyone has the ability to do this, so for those people maybe a 2% cash back card is the better choice. Rewards earning is very much a personalized thing, there is no one "optimum" solution...it all depends on the person.